Have you heard of St. Anne's Helper? We have Catholic resources for schools, homeschool, and converts: Audio Catechisms, Catechism Booklets, Catechism Copybooks, and coloring pages to make teaching the catechism easier. 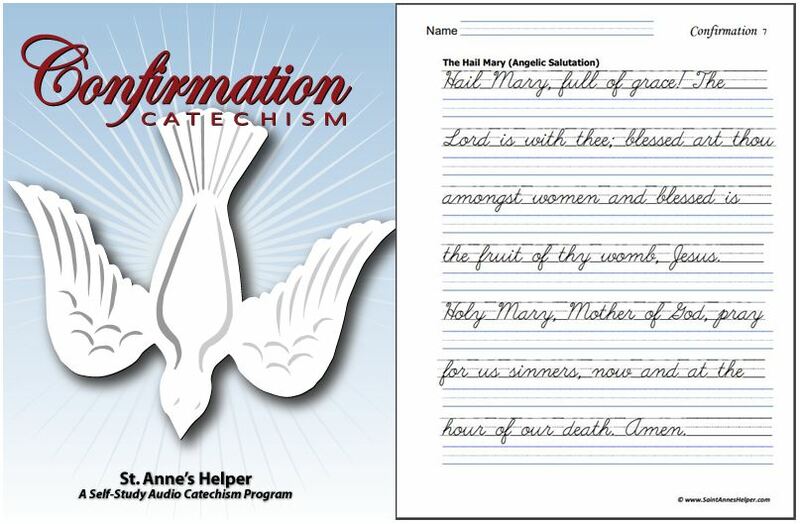 St. Anne's Helper Audio Catechisms use the clear and concise 1950s Baltimore Catechism for First Communion, Confirmation, and other catechism related topics like the lives of the saints and the Catholic holy days. We have the same text available for First Communion and Confirmation in printable worksheets. 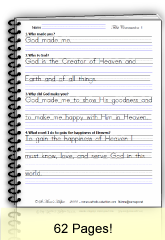 Each download has both manuscript and cursive so your children can practice their penmanship while they learn the truths of the faith. We have the same information in personalizable booklets that has related pictures that the children can color. The booklets are handy for reading. We have an abundance of Catholic coloring pages to print. We also have Catholic coloring pages to print pictures of saints and Bible stories. See our many saints coloring pages, rosary coloring pages, and seasonal coloring pages on our main coloring page. How can a Catholic Ebook help one learn the Catholic Religion? Review. Review is what most of us need when studying. Now you have a helper whether you are learning or teaching. At St. Anne's Helper the material is the Catholic catechism, the questions and answers are on separate tracks and can be repeated until the answer is memorized. The exact same material is available on both audio book downloads and Catechism Copybook Ebooks - booklets with the questions and answers or copybooks for copying the catechism answers. We also have free coloring pages to print for any time of the year! The CDs are reusable, they are portable, and they are easy to use. 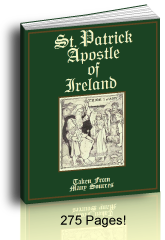 The CDs and the downloads have the same information and can be used as Catholic audio books and as Catholic Ebooks. If you have an eReader, you can study the minimum knowledge necessary for the sacraments of the Holy Eucharist and Confirmation. Catechists are thrilled to be able to recommend the CDs for parents to use as review with their children; and parents are thrilled to have the tutorial help teaching their children such catechism answers as the Ten Commandments and the Catholic Prayers. 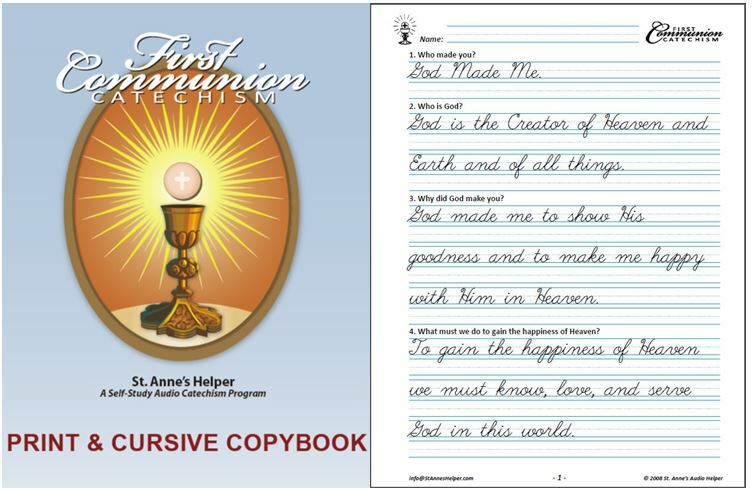 If you run a Catholic Sunday school, RCIA, or CCD class you'll love St. Anne's Helper Catholic Worksheets from our Catechism Copybooks. We also have hundreds of fun coloring pages to print! Instant busy work while you read Bible stories and stories about the Catholic saints. First Communion (Vol. 1 Baptism - Holy Eucharist) Learn the Catholic Ten Commandments, Apostles' Creed, and Baltimore Catechism answers for First Communion as Mary reads the questions and answers for you to practice or simply listen and learn. Where the same answers are queried in the Confirmation Catechism they, have the same answers. Order our worksheets, booklets, and audio products here. Confirmation Catechism (Vol. 2 Catholic Sacraments - Holy Trinity) Learn the main questions and answers from the Baltimore Catechism that are good to know in preparation for Confirmation as Anthony reads the questions and answers for you to practice or to simply listen and learn. Order Worksheets, booklet, and audio products here. Memorize the best answer the first time! Many real life decisions depend on the truths of the Catholic Religion so it is good to have a short version of the basic truths memorized for future reference. Oh how frustrating it is to have different catechisms through the years and to try to undo what had been memorized previously just to get a good grade on a test. The Catholic Church's habit has been to use the same phrases throughout a particular catechism series and to print only what was certain. We have kept this habit for your edification and ease of use. It is so much easier to learn a definition right the first time so that it is the same throughout the years. Adults can use St. Anne's Helper for Catholic audio book "Cliff notes"! St. Anne's Helper has Catholic catechism ideas that correspond with the Baltimore Catechism, the favorite catechism of catechists and homeschoolers. The old Baltimore Catechism has the longest history of approval and use in the United States and it is generally sold in several booklets. An audio Baltimore Catechism covers the Baltimore Catechism No. 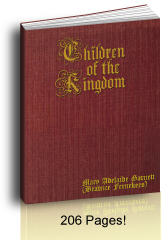 1 answers, and the main Catholic prayers including the main Catholic prayers for children. 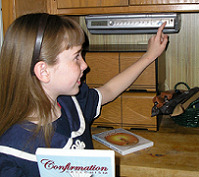 Catholic religious education and Catholic home school books abound these last years. 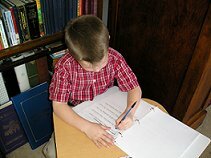 Many more Catholic book publishing companies are writing books for Catholic homeschool and are providing many Catholic books as audio book downloads. 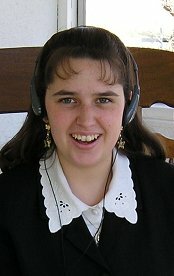 Catholic audio books and Catholic ebooks are easy to buy and easy to use. They've been a huge help in our family from learning the catechism, to reading the Douay-Rheims Bible along with the book, to using CDs to learn Math. There are so many more homeschool resources now that can really help make learning at home so much easier and better like Catholic homeschool worksheets and coloring pages. 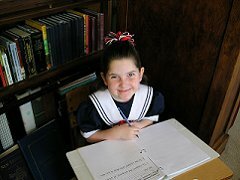 There are companies who have developed wonderful Catholic homeschool curriculum including our favorites: Our Lady of Victory (OLVS), Seton Home Study School, Mother of Divine Grace, and Kolbe. Who Runs St. Anne's Helper? Our website is written by a Roman Catholic family that wants to share traditional Catholic treasures that help you, your students, and your children keep the faith. One of us is a cradle Catholic, another is a grateful convert, and two have been teaching in a Dominican girls' school. We've spent time as catechists, as teachers, as parents of children in school, and as homeschooling parents. We have slogged through many books that were called Catholic to find the best for teaching the faith. See our audio catechism story here. When we talk to other catechists and parents we find that they would like to have supplemental help with their own Catholic Religious Education programs so that parents have resources at home, too. They would like to know the best Catholic answers to questions of the Faith in an easy and concise format, also. Many of our friends are adult converts and they, too, rejoice to find precise and concise answers in Catholic ebook or audio book format (PDF and MP3). Catholic schools and parishes have linked to our pages as resources for their students in Catholic Religious Education. Welcome! And know that you have had our prayers for many years now, because we pray for all of our visitors past, present, and future! In your charity, please remember us in your prayers. Catholic prison ministries, like the Blue Army, are stocking St. Anne's Helper Audio Books in their libraries for their aspirants who hope to learn the Catholic Faith, too. We ask your prayers for their success and preservation in the Catholic Faith. Capitalize on this right by studying the Roman Catholic Religion well. Once your children know the basic Catholic beliefs, they can make good decisions throughout their entire lives. Add Roman Catholic Bible and saints stories as recommended by the USCCB instructions on the Catholic catechism. Search our site from nearly any page for the ideas you need. Our pages are packed with information from the Catholic catechism so as to over-deliver! Our Google ads help support our website and we have chosen to have them tightly filtered. If you find objectionable ads please send us the URL addresses through our Contact Us form and we can block them. All other external landing pages are hand picked to give you the most Catholic information that we can find. Our St. Anne's Helper Catechism ideas teach the basic Catholic beliefs according to the Baltimore Catechism for Catholic Baptism, Catholic Confirmation, and the Catholic Eucharist and the other Catholic sacraments. These concur with every Catholic catechism available. You now have audio, copybook, and coloring help with St. Anne's Helper! Order them here. Thank you for visiting St. Anne's Helper!